I'm a big fan of multi-taskers. Take the knife for instance, it slices, it dices and it can protect you in a hobo fight! It has so many uses! I could be in my kitchen, minding my own business, just slicing up some kiwis, bein' all healthy and sh*t, when out of nowhere, a maniac does a sweet judo roll thru the sliding glass doors and right into my kitchen wielding a hand gun. Without missing a beat, I do a blind turn and stab my assailant right in the heart with my 6 in. chef's knife, then I calmly return to cutting up my kiwi fruit, only after I have gently removed the blood from my blade and hopefully had called 911, at some point during this scenario. Now that's a multi-tasker! The iPad, on the other hand, cannot chop kiwi fruit nor can it defend my honor in a vicious kitchen brawl. This is just one of the many reasons that I cannot support the iPad. My husband recently purchased an iPad because he is an idiot. I do not understand the iPad or the people who own them. "The iPad has so many cool apps and functions, though!" Me, "So, just like my iPhone that I already own and pay for?" 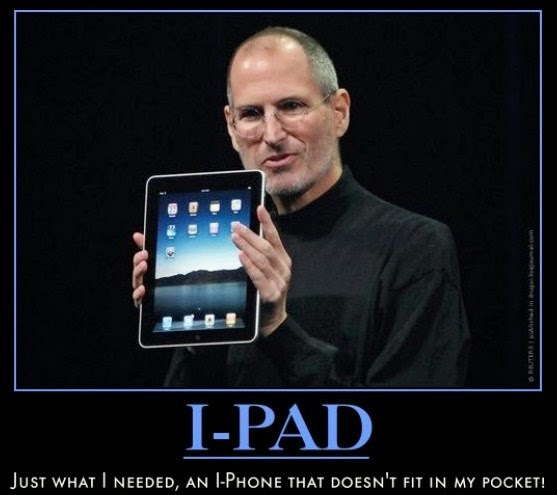 "The iPad is also way lighter and easier to carry than a laptop." Me, "I thought you wanted to lose weight?" "But, it has a way bigger screen!" Me, "Just like my laptop that I already own and pay for?" My laptop also has a functioning, real world, keyboard, has more storage capabilities than the iPad and oh yeah, I ALREADY OWN IT AND HAVE PAID FOR IT!!!! I think the iPad is just for people who love to spend money, for no reason. I think if everyone who has purchased an iPad used that same money on charity, instead of this expensive uni-tasker, we probably would have cured AID's by now. Therefore, if you buy an iPad, clearly you want AID's to win. Not cool, not cool everybody. Keep in mind, that I have written this on my old timey, clunky, heavy, already paid for laptop. It's so heavy, in fact, that I can sling it at that guy coming thru my window, right now; and it will probably kill him on impact and still function, even after the collision. Now that's a multi-tasker!